Above Standard, One Bedroom and Loft and Two Bath condominium walking distance to the Canyon Lodge Ski Lift area in Mammoth Lakes. Sleeps up to 6. 1 Queen bed in bedroom, 1 Queen bed and 1 set of Bunk beds in the loft, & 1 Queen sofa sleeper in the living room. 3 TVs, Flat Screen in Living room, flat screen in bedroom and TV in Loft, 2 VCRs, DVD (Living Room), Stereo/CD. Wifi Internet access in the unit. Phone in unit 760-924-5658 (1050 sq. ft.). First floor is the Bedroom, Kitchen, Dining Room, Living Room and 1 full Bathroom. The second floor is the Loft and the 2nd full Bathroom. The Loft is enclosed except for the stairwell area. This is an upstairs unit...you enter the unit from an enclosed hallway in the Chamonix A Building. Chamonix Recreation room with large screen TV, reading area, ping pong, foosball, and business center with fax, copier, computers w/ internet and laptop hook-up. Sauna, hydro spas, seasonal/summer swimming pool & BBQ area. Coin-operated laundry facilities located in the common area near the office. COMPLIMENTARY INTERNET and CABLE TV are provided, however NO REFUNDS will be given for connectivity problems or Internet failure. TOT LICENSE 1968-CX12. Good location ! Walking distance to canyon lodge. Our stay here was exactly what we needed! The check in process was easy and the location was outright perfect! Thank you for leaving the condo tidy and neat-we appreciated that very much! The check in was easy, the condo was clean and very comfortable, and the location is excellent for skiers. We would love to stay here again next time. Everything worked out fine. Thank you for being so organized. Everything was perfect. We have been going to Mammoth every Summer for the past 30 years. Using Central Reservations was the best decision ever. Everything went smoothly. Thanks for letting us check in a little earlier. I also liked the fact that there werent all those extra fees like other reservation outfits charge. Its out of control. I thought our Mammoth days were over. I was so happy that the Wildflower Complex referred me to you guys. Please dont follow other reservation bureaus and charge the ridiculous cleaning fees, etc. They are out of control. Will be using you again on our next visit next year and will refer you to our friends. P.S. We really liked our unit. It was very nice and comfortable. Usually stay to Wildflower. This was a nice change. My family and I really enjoyed the stay. The condo was spacious for the 4 of us and well equipped. Doing business with you was easy. We had a great time up there and would certainly use you again. Thank you! We had a wonderful time. The property management instructions were clear, the unit was very comfortable. 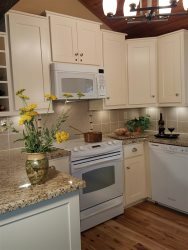 We most enjoyed the proximity of the complex to the beautiful lakes and the kitchen was well-appointed.